A junior doctor’s furious letter to David Cameron over the Government’s plans to overhaul the NHS has won the support of thousands. Janis Burns, 26, who works at the Royal Brompton and Harefield NHS Foundation Trust, challenged the Prime Minister to attempt to treat a patient “on the brink of death” after a long stint of night shifts. “You try managing that after you’ve been up all night and then tell me the NHS isn’t 24 hours 7 days a week 365 days a year,” she wrote in the letter which has now been shared more than 80,000 times on Facebook. She also accused Heath Secretary Jeremy Hunt of “deliberately attacking” the profession and being “hell bent” on convincing the public that doctors do not provide a seven-day service. 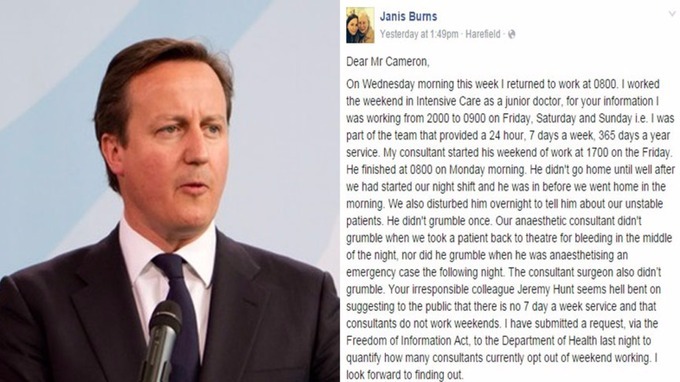 Burns – who reportedly tried to hand deliver the letter to Number 10 after coming off a weekend of graveyard shifts – wrote the letter in reaction to the ongoing row over the UK’s NHS service.